When my awesome Sequel Christmas Mani chipped the DAY before Christmas, I had no choice but to put together a quick polish change because naked nails are the worst, especially in pictures. However, it kind of worked out because I got to try a new polish! Yay! After a delightful birthday pedicure with my Mum, we popped next door to Sally's and she treated me to a whole whack of nail-related things. One of them being Seche's new limited edition colour: Collage Overlay! It's my first Seche polish ever and aside from being disappointed with the utterly uncreative name, its multidimensional glitter (in three shapes no less) is so pretty that it evens out the blah name. Two coats of Paper Mâché, one coat of Collage Overlay on all fingers except feature, which has one coat of It's a Trap-eze! 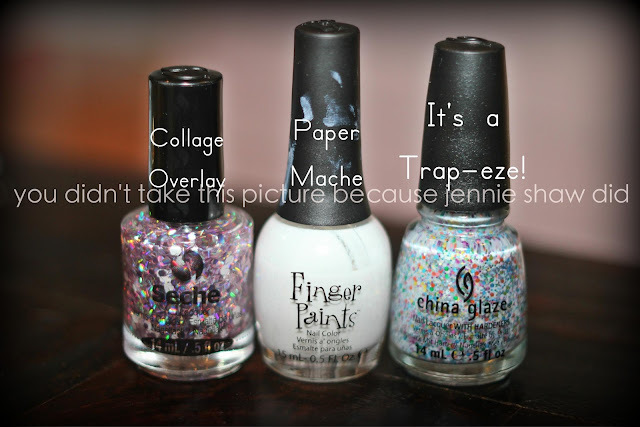 Now, Collage Overlay is beau-ti-ful but be warned that the chunky pieces of white glitter are HUGE! I have freakishly big and curved nail beds and even with a couple coats of top coat, I could still feel the edges of the larger octagons. You can't really see them in the picture because I layered it over a white polish, but rest assured, they're there. I love how the sparkles change in different light and although I thought that they'd need a second coat, I'm happy that I stuck with one because I think that the straight sparkles would overpower the larger ones. And, as always, It's a Trap-eze! is freaking fantastic and makes my little heart soar with glee. And, again, thanks to Tara and Vicki for hosting! 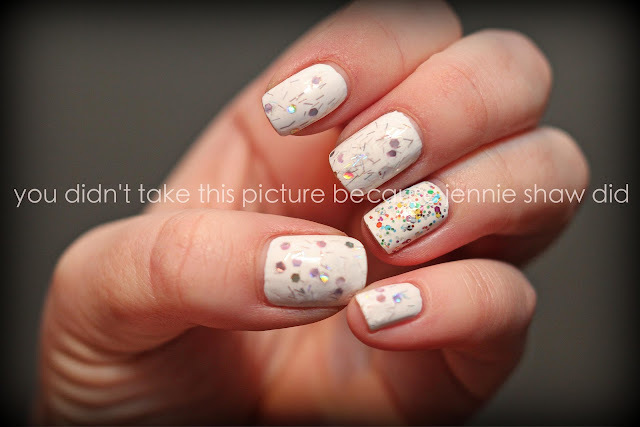 love the Seche glitter-its so different! Very pretty glitters. I hadn't yet seen the glitter from seche. Happy New Year! umm i had no idea seche had glitter polish! apparently i've been living under a rock! I agree, naked nails are the worst.